World Record holding distance driver that is easy to learn disc, and lighter weights will give newer players extra distance. The Valkyrie currently holds the World Record at 820'. In lighter weights gives new players extra distance. Lighter weights also give players extreme range when thrown downwind, while maximum weights can give excellent upwind distance. 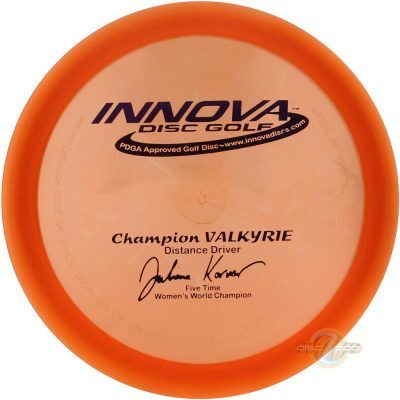 The Valkyrie’s high speed turn and flight characteristics make it great choice for long range turnover shots and rollers. The Star Valkyrie is endorsed by World Record distance holder Christian Sandström. This is my favorite driver. It is an incredibly versatile disc for me. It works very well with my throwing style. I tend to throw low and the Valkyrie gets great distance with low thrown shots. I typically carry three Valkyries with me during a round. One is beat and used for long turnover shots. The others can be used for hyzers and subtle helix shots.